Free Airmail Shipping ! Yes, free "World-wide" Airmail Shipping for all Capacitor and Resistor Kits. Resistors in each kit have been specifically selected for tube radio, tube hi-fi, tube audio/guitar amplifier and tube based TV restorations. You get the most often needed resistor sizes in our Resistor Kits. Our kits are not front-loaded with low ohm values (not used in tube electronics) that you will never use. We include the sizes you will use. All resistors are new "fresh" stock. We do not sell NOS (new old stock). All resistors are high voltage "normal" size body type. We do not stock the cheaper, low voltage "small" body type. All resistors are ISO certified and 100% RoHS compliant. For your added safety our 1W & 2W Metal Oxide Resistor Kits and 5W & 10W Power Resistor Kits are "flame proof". Free heat-shrink / spaghetti tubing with each resistor kit. Resistor Kits offer $ savings over buying individual resistors. 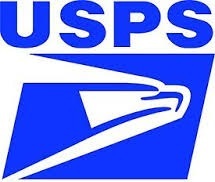 Free First Class USPS Airmail Shipping for all USA, UK, Australia, International/Overseas orders. We ship worldwide. All prices are in US$ and all Resistor Kits come with a Money Back Garantee. This kit contains 270 premium carbon composition resistors .... 3 each of all ninety (90) sizes 10 ohm thru 22M ohm. RCD of New Hampshire, USA has been committed to quality for over 40 years. RCD Headquarters and Manufacturing Facility are at Manchester, New Hampshire, USA. Additional RCD products are produced in Europe, the Caribbean and Asia. Construction: These brand new factory fresh RCD carbon composition resistors feature rugged hot molded construction. The resistance material, insulation material and lead wires are all hot molded together at the same time into one solid integrated resister. The result of this hot molded construction is a resistor that is mechanically strong without any cracks or crevices that could adversely affect performance. Total length of each resistor is 60mm with body size 3.56mm by 9.53mm. 100% non-inductive construction for pure resistance. "Classic" vintage resistor appearance and that warm tube sound of yesteryear. Ideal for tube radios, amps, TVs, etc. High insulation to protect against shorts. ISO 9001:2000 certified and 100% RoHS compliant. Proudly made RCD (Headquarters HN,USA). and 22M ohms all at 1/2 Watt. 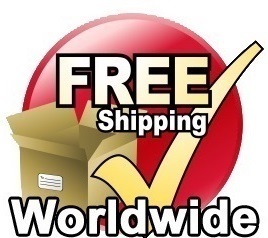 Free World-wide Airmail Shipping of Resistor Kits ! Never run short of the resistor size you need. This kit contains 435 Classic carbon composition resistors .... 5 each of all eighty-seven (87) sizes 2.2 ohm thru 10M ohm. Construction: Brand new stock carbon composition resistors by KAMAYA OHM via their ISO 14001/9001 certified Japan production facility. The resistance material, insulation material and lead wires are all hot molded together at the same time into one solid integrated resister. The result of this hot molded construction is a resistor that is mechanically strong without any cracks or crevices that could adversely affect performance. 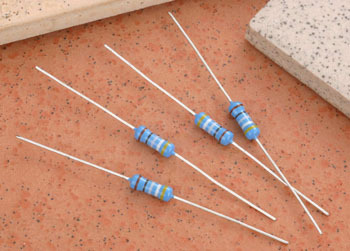 Total length of each resistor is 62mm (aprox 2 1/2" long) with body size 3.5mm by 9.5mm. 100% non-inductive construction for pure resistance. "Classic" vintage resistor appearance and tolerance for that warm tube sound of yesteryear. Ideal for tube amps, radios, TVs, etc. Improved pulse endurance characteristics compared to carbon-film resistors. Quality Production by ISO 14001:9001 certified KAMAYA OHM. Never run short of the resistor size you need. This kit contains 228 premium carbon composition resistors .... 2 each of all 114 sizes 10 ohm thru 22M ohm. RCD of New Hampshire, USA has been committed to quality for over 40 years. RCD Headquarters and Manufacturing Facility are at Manchester, New Hampshire, USA. Additional RCD products are manufactured in Europe, the Caribbean and Asia. Construction: These brand new factory fresh RCD carbon composition resistors feature rugged hot molded construction. The resistance material, insulation material and lead wires are all hot molded together at the same time into one solid integrated resister. The result of this hot molded construction is a resistor that is mechanically strong without any cracks or crevices that could adversely impact performance. Total length of each resistor is 60mm with body size 3.56mm by 9.53mm. 100% non-inductive construction for pure resistance. This kit contains 210 premium RCD 5% carbon composition resistors....7 each of the thirty (30) most often needed resistor sizes for tube radios, amplifiers, television, etc. Constuction: Same as Kit # 1A above. Proudly made RCD (Headquarters NH,USA). This kit contains 408 Classic carbon composition resistors .... 12 each of the thirty-four most often needed ohm sizes. Construction: Same as Kit 1B above. Quality Production by ISO 9001:14001 certified KAMAYA OHM. all at 1/2 Watt with the classic 10% tolerance. This kit contains 300 "classic" carbon composition resistors .... 6 each of fifty (50) different sizes, 2.7 ohm thru 22M ohm..
Construction: Ruggedly constructed, these brand new high quality carbon composition resistors are made by mixing particles of carbon graphite powder with a binder which is molded and baked into the traditional cylinder shape of carbon composition resistors. Total length of each resistor is 60mm with body size 3.5mm by 9mm. Non-inductive construction. Contains 6 each of fifty (50) different resistor sizes. Working Voltage: 400V (this is a full 50 Volts better / higher than most carbon comp'n resistors ie greater reliability and longer life). Excellent characteristics against high voltage surge current. "Classic" vintage resistor appearance and that tube radio sound of yesteryear. ISO 9002 & UKAS certified and 100% RoHS compliant. & 22M ohms all at 1/2 Watt. This kit contains 300 "classic" carbon composition resistors (10% tolerance) .... 10 each of 30 often needed resistor sizes for tube based circuits. Resistor Construction: Same as Kit # 3 above. Contains twelve each of the 25 most often needed ohm values. This kit contains 610 high quality precision half watt Metal Film resistors .... 10 each of sixty-one (61) popular sizes, 10 ohm thru 1M ohm . Construction: Constructed of a resistive element of a very thin layer of metal alloy vacuum deposited on a high-thermal conductive ceramic rod. This technology is able to support accurate characteristics over a very broad resistance range. Solder plated copper lead wires for easy soldering. 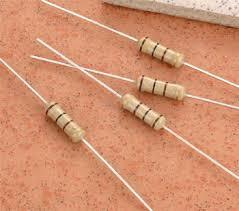 Length of each resistor is 65mm with body size 3.2mm by 9mm. Extremely precise and stable resistor suitable for: test equipment, scientific equipment, Hi-end receivers, tuners, etc. Low temperature coefficient for high stability of resistance as temperature changes. Meet American military specification MIL-R-10509F. ISO 9002, UKAS & BSI certified and 100% RoHS compliant. & 1,000,000ohms all at 1/2 Watt. This kit contains 600 high quality precision half watt Metal Film resistors .... 20 each of the thirty most often needed sizes..
Resistor Construction: Same as Kit # 5 above. High reliability. High Stability. Flame Proof Coating. A "practical replacement" for Carbon Composition Resistors. Never run short of the resistor size you need. This kit contains 595 top quality flame-proof metal oxide & carbon film resistors .... 7 each of all eighty-five (85) sizes 1 ohm thru 20M ohm. Construction: Resistance element is formed by the oxidation reaction of a vapor or spray of tin chloride or tin-oxide film over a high thermal conductive rod. A flame proof coating is then applied. Total length of each 1 watt resistor is 70mm with body size 4.5mm by 11mm. *680K and over are flame-proof carbon film. Wattage: 1 Watt ( Replace your 1/2W carbon comp with 1W metal oxide ). Working Voltage: For Metal Oxide working voltage is 350V with maximum overload voltage of 600V. For carbon film the working voltage is 500V with overload voltage of 1000V. Excellent resistor for use in high power circuits such as tube radios, amps, TVs, etc. High stability and high reliability under diverse conditions and high temperatures. Ideal for use in tube electronics. A practical replacement for 1/2W carbon composition resistors. Solder plated copper wire axial leads. A "popular replacement" for Carbon Composition Resistors. This kit contains 600 high quality flame proof metal oxide/carbon film resistors ..... 20 each of the 30 most often needed post-WWII sizes Highly stable and reliable, these resistors are "popular replacement" for carbon composition resistors. Construction: Resistance element is formed by the oxidation reaction of a vapor or spray of tin chloride or tin-oxide film over a high thermal conductive rod. A flame proof coating is then applied. Total length of each 1 watt resistor is 70mm with body size 4.5mm by 11mm. *680K and over are flame-proof carbon film type. Ohms: Kit contains the 20 each of the thirty most often needed (post-WWII) resistor sizes. A popular replacement for 1/2 watt carbon composition resistors. A "favorite replacement" for Carbon Composition Resistors. If you restore tube radios from the 1920's and 30's you will need resistor sizes/ ohm values in this kit. This kit contains 600 high quality flame proof resistors ..... 24 each of the 25 most often needed pre-WWII resistor sizes used in vintage tube radios. This kit contains "hard to find" pre-WWII ohm values such as 500 ohms, 5K ohms, 25K ohms, 500K ohms etc. Highly stable and reliable, 1W metal oxide/carbon film resistors are "favorite replacement" for carbon composition resistors. Construction: Resistance element is formed by the oxidation reaction of a vapor or spray of tin chloride or tin-oxide film over a high thermal conductive rod. A flame proof coating is then applied. Total length of each 1 watt resistor is 70mm with body size 4.5mm by 11mm. *Sizes over 500K are flame-proof carbon film type. Ohms: Kit contains the twenty-four each of the 25 most often needed (pre-WWII) resistor sizes. A favorite replacement for half watt carbon composition resistors. A "economical replacement" for Carbon Composition Resistors. If you restore tube radios from the 1920's and 30's you will require the resistor sizes/ ohm values in this kit. This kit contains 600 carbon film resistors ..... 24 each of the 25 most often needed pre-WWII resistor sizes used in vintage tube radios. This kit contains "hard to find" pre-WWII ohm values such as 500 ohms, 5K ohms, 25K ohms, 500K ohms etc. Highly stable and reliable, 1W carbon film resistors are an economical for carbon composition resistors. Construction: The carbon film resistor is made by placing the carbon film/layer on a ceramic substrate. The carbon film acts as the resistive material to the electric current. Total length of each 1 watt resistor is 70mm with body size 4.3mm by 11mm. Ohms: Kit contains the 24 each of the 25 most often needed (post-WWII) resistor sizes. Working Voltage: 500V with maximum overload voltage of 1000V. High stability, high reliability and economical priced. Ideal for use in tube and transistor electronics. An economical replacement for 1/2 watt carbon composition resistors. An "economical replacement" for Carbon Composition Resistors. This kit contains 600 high quality carbon film resistors ..... 20 each of the 30 most often needed post-WWII sizes Highly stable and reliable, these resistors are an "economical replacement" for carbon composition resistors. Never run short of the resistor size you need. This kit contains 575 top quality flame-proof 1 watt resistors .... 5 each of all eighty-four (84) sizes 1 ohm thru 20M ohm and an extra 5 each for the 30 "most" needed 30 sizes. In other words... 10 each of the most needed sizes. Construction: Resistance element is formed by the oxidation reaction of a vapor or spray of tin chloride or tin-oxide film over a high thermal conductive rod. A coating is then applied. Total length of each 1 watt resistor is 70mm with body size 4.5mm by 11mm. *Sizes over 680K are flame-proof carbon film type. An economical replacement for one-half watt carbon composition resistors. and 5 of 20M ohm all at 1 Watt. Never run out of the ohm size you need. 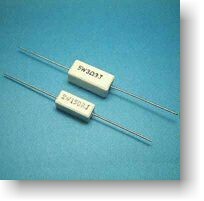 These 2W resistors can be used to replace 1/2W, 1W & 2W resistors. This kit contains 425 high quality flame-proof metal oxide / carbon film resistors .... 5 each of all eighty-five (85) sizes 1 ohm thru 10M ohm..
Construction: Resistance element is formed by the oxidation reaction of a vapor or spray of tin chloride or tin-oxide film over a high thermal conductive rod. A flame proof coating is then applied. Total length of each 2 watt resistor is 80mm with body size 5mm by 15mm. *330K and over are flame-proof carbon film type. Wattage: 2 Watt (Can be used to replace 1/2W, 1W and 2W resistors). Working Voltage: For Metal Oxide working voltage is 350V with maximum overload voltage of 800V. For carbon film the working voltage is 750V with overload voltage of 1500V. Excellent resistor for use in high power circuits. High stability, superior resistance to heat and high reliability in high voltage applications. Ideal for use in tube radio, amp, TV electronics. 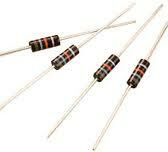 A popular and economical replacement for old carbon composition resistors. & 10M ohm all at 2 Watt. This kit contains 416 metal oxide resistors ..... 16 each of the 26 most often needed post WWII ohm values Highly stable and reliable, metal oxide resistors are "favorite replacement" for carbon composition resistors. .
A practical, economical replacement for old carbon comp resistors. This kit contains 405 metal oxide resistors ..... 15 each of the 27 most often needed pre WWII ohm values Highly stable and reliable, metal oxide resistors are "favorite replacement" for carbon composition resistors. .
Construction: Resistance element is formed by the oxidation reaction of a vapor or spray of tin chloride or tin-oxide film over a high thermal conductive rod. A flame proof coating is then applied. Total length of each 2 watt resistor is 80mm with body size 5mm by 15mm. *250K and over are flame-proof carbon film type. Construction: 5 watt resistors up to 180 ohms are wire-wound. Higher resistance sizes are made of metal oxide. Metal oxide type is made by depositing a tin oxide on a substrate, resulting in good stability. Wire wound type is constructed by wrapping lengths of high resistance wire over an insulated form. Both types are encased in ceramic (a special type of cement) that is heat and moisture resistant. Total length of each 5 watt resistor is 85mm with body size 9mm by 10mm by 22mm. Working Voltage: Working Voltage is 350V with max overload voltage at 700V. Highly heat resistant, moisture resistant and high mechanical strength. Made of non-inflammable materials, so that even if overcurrent flows, there is no self-ignition. Complies with safety standards such as UL Standard, Electrical Apparatus Control Law, etc. Construction: Ten watt resistors up to 470 ohms are wire-wound. Higher resistance sizes are made of metal oxide. Metal oxide type is made by depositing a tin oxide on a substrate, resulting in good stability. Wire wound type is constructed by wrapping lengths of high resistance wire over an insulated form. Both types are encased in ceramic (a special type of cement) that is heat and moisture resistant. Total length of each 10 watt resistor is 110mm with body size 9mm by 10mm by 50mm. All Resistor Kit prices are in U.S. Dollars. our 2CheckOut Secure Credit Card Payment Page. USA customers mailing payment, please note that a letter from USA to Canada requires $1.20 stamp. If you live in Canada and wish to mail in payment in Canadian $'s you can use the Bank of Canada Currency Converter and add the approptiate HST/GST . If paying by check, allow a week for check clearance (if you are new customer). All resistor kits are mailed out 1st business day following payment. For Kit Orders we offer free worldwide Air-Mail. For Canadian customers, the appropriate HST/GST will automatically be added by paypal at check-out. no further discounts of any kind are allowed on Resistor Kits. Money Back Guarantee on all resistors. Resistor Kit availability and prices are subject to change. The above kits and prices are effective April, 2019.